The48LawsOfPower.com is an independent web site and is not affiliated with, nor has it been authorized, sponsored, or otherwise approved by any other web site. The mission of The48LawsOfPower.com is educational only, to present ideas of powerful and successful figures throughout history, collected and formulated by Mr. Robert Greene. The48LawsOfPower.com takes your privacy seriously. The48LawsOfPower.com does not send any bulk mailings, newsletters, promotional nor automated emails. The48LawsOfPower.com does not use any subscription lists. The48LawsOfPower.com does not collect any email addresses. All The48LawsOfPower.com web sites have been produced with the utmost care. Nevertheless The48LawsOfPower.com cannot guarantee that the information contained therein is free of error and accurate. The48LawsOfPower.com claims no liability for damage that occurs directly or indirectly from use of this website. Downloading files and entry of private data is executed at the sole risk of the user. 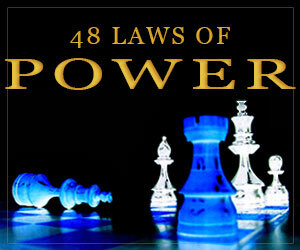 The48LawsOfPower.com has placed a number of links to other web sites on The48LawsOfPower.com web site. The48LawsOfPower.com expressly declares that The48LawsOfPower.com has no influence whatsoever on the content of the linked sites. Consequently The48LawsOfPower.com distances itself from all content of these sites and deny ownership of such content accordingly. This declaration applies for all links and the content of web sites to which The48LawsOfPower.com links guide. The The48LawsOfPower.com makes no warranty or representation as to the accuracy, completeness or reliability of the information published on The48LawsOfPower.com and accepts no liability (including for negligence) in respect of any of the information on this website.